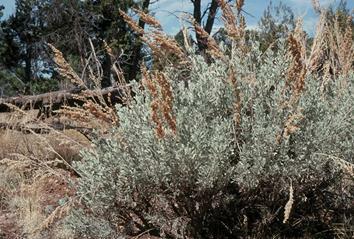 Big Sagebrush, Artemisia tridentata, Nutt. Occurs in semiarid climatic regimes in desert and semi-desert conditions. Basin big sagebrush (A. t. ssp. tridentata) grows on sites with deep, well-drained soils and average precipitation between 10-18 inches per year (occurring mainly in the fall and winter months). The other big sagebrush subspecies (A. t. ssp. spiciformis, A. t. ssp. vaseyana, A. t. ssp. wyomingensis, A. t. ssp. xericensis) tend to occur on more xeric sites. Elevation ranges are variable: 4,800-5,800 feet (1463-1768 m) in Arizona, 100-7,000 feet (30-2134 m) in Oregon, 2,001-7,019 feet (610-2140 m) in northeastern Utah. 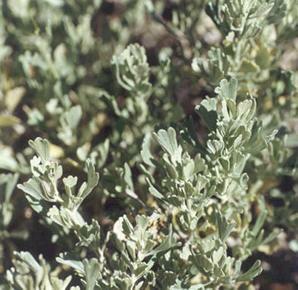 Prefers deep well-drained soils; locally occurs throughout the dry interior of eastern Washington; dominates the Columbia Basin shrub-steppe zone. May be propagated by seed in the spring and by cuttings taken in late summer through winter. Big sagebrush seeds have been determined to be relatively short-lived, remaining viable less than 5 years in warehouse storage. Storing with a low moisture content (6 to 8% is optimal) and at relatively low temperatures (<10 °C) can extend storage life to 5 years and possibly longer. (Woody Plant Seed Manual) Most sagebrush seeds are not viable in the seedbank for more than 1 year. Fire may reduce emergence of big sagebrush (FEIS database). Grow best in light, well-drained soils. Prefer not to be in alkaline soils. For direct seeding Meyer recommends a seeding “rate of 0.1 to 0.2 kg/ha (1.5 to 3 oz/ac) on a pure live seed (PLS) basis for a lot that averages 4 million seeds/kg (113,400/oz)” (Woody Plant Seed Manual). Alvarez-Cordero, E. and C. M. McKell. 1979. Stem cutting propagation of big sagebrush: Artemisia tridentata. Journal of Range Management 32 (2). Hitchcock, C. L, and A. Cronquist. 1973. Flora of the Pacific Northwest, An Illustrated Manual. University of Washington Press, Seattle.